1. Find the Roadblocks: To get started, it’s great for us to have an idea of who you are and for us both to understand where your roadblocks have been. You’ll answer some written questions to help us zero in on your biggest challenges, and let you get the most out of our work together. 2. Mapping Sessions: During a 90-minute focused session on a meeting call together. You’ll understand what’s been keeping you from succeeding in the past. We’ll teach you the most important steps to take to get started down the road to permanent change and how to align yourself with visionary thinking. You’ll feel hopeful, excited and ready to move forward on your ministry vision journey. To apply what you are learning in a consistent manner, the mapping session must be followed up by the next steps action plan and completed to get the most value out of our time together. 3.Email support: You may have questions once you start applying what you’re learning. In between the first session and the last follow up session, We’re happy to provide you with guidance by email Monday through Friday. 4. The 90 Day Vision Planner & Toolkit: Following our sessions, you’ll get a personal plan, your “road map,” to help you continue the work of transforming your ministry into a strategic vision. You can dump forever the limiting mentality that has kept you from reaching your goals. We’ll give you this powerful tool for making purposeful things happen in your ministry and in your life. We really do know what you’ve been going through. We’ve been there. 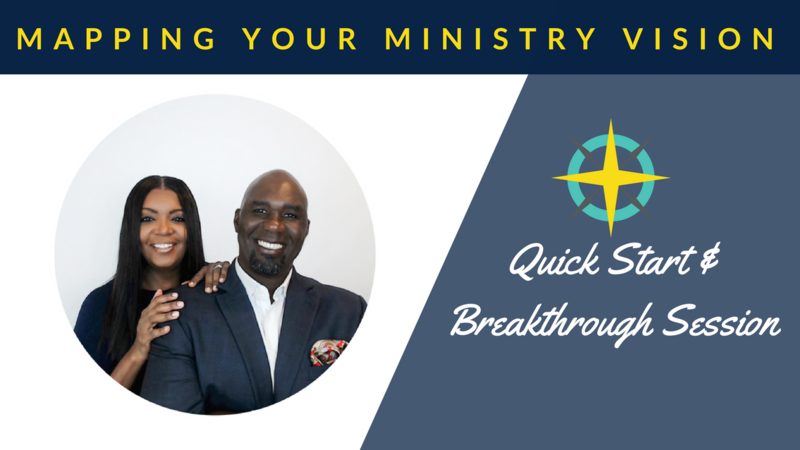 Now we want to help you end your ministry growth issues, and live a life of purpose, clarity and value. You can do it. You CAN be a be a Visionary accomplishing a God Sized Vision.